I was asked to write about the ‘ins and outs’ of starting a business as a woman over 50. I decided to tackle this subject, no holds barred! 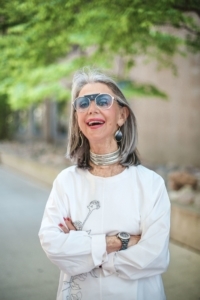 So, today, I am sharing my tips for going into business after 50. On a most positive note, don’t let your age hold you back. On a serious note and warning, don’t tread into waters you know nothing about because in most instances you will drown. I learned this the hard way, not become I was dumb but because I was naïve. However, my determination and love for what I do have been my saving grace. In most cases, love and determination will not save you. Experience will. Her kind words opened up a new window of thought. I kid you not; my gears started racing. As I mentioned, I am an adventurer and optimist to the max, in everything I do. If I did not live outside the box, I would smother. I will travel anywhere, I look forward to meeting many different types of women, try most exotic foods, open myself up to new ideas… you name it and I will try it with glee. Taking a chance did not scare me; I had an adrenaline rush, so I leaped. Am I sorry five years later? Absolutely not. Why? I came away a winner because learning the ins and outs of the technical side of the Internet has left me a wiser woman in an industry that is front and center on the world stage. And I am much older than 50. The most significant and momentous part of owning a company after 50 has been the emotional impact. Writing for Honey Good has been a heartwarming experience. I have female friends all over the world who interact with me on Facebook, Twitter, Instagram, Pinterest, LinkedIn, and on my site, HoneyGood.com. These interactions provide me with daily gratification. And I, of course, share my stories with them on relationships, beauty, style, survivorship and my Sunday Stories. Would I start this business again? Yes. But, I could have prevented many needless challenges if I had Internet knowledge and skills. I have had to learn everything ‘on the job’ while remaining determined to run my company. I hired ‘my girls,’ to carry me through to the finish line. They are an essential part of the equation. My team provides my company with Internet and exposure. I drive them crazy bombarding them with a million daily emails. Harmony is fundamental with your co-workers! Luckily, we are 99% of the time in sync and appreciate each other’s skills. Failure may not be in your vocabulary. None of the above is easy, darlings, and yet… a goal in the second half of your life is to feel visible, powerful and happy. You attain this when you know you are a relevant woman. If you desire to open a business, if you are educated in the field, and if you have an entrepreneurial spirit, my advice is to spread your wings and go for it. There will always be the ins and outs of going into business after 50, but remember, there are the ins and out in daily living. So live your life in style… be vibrant, be visible, and be YOU. Your attitude should be: THE BEST IS YET TO COME AFTER 50! Have you gone into business after 50 or are you thinking of doing so? Do tell! If you have tips for going into business after 50, please do share yours either in the comments below or on Facebook, Twitter, and Instagram. What is this DROPBOX you speak of??? Hmmmm …I don’t understand LOL ??? ?